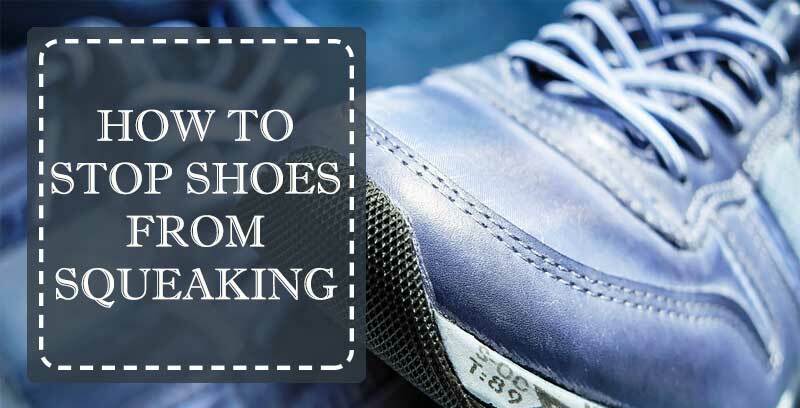 There are different reasons and sources of squeaking in shoes, but it can really be annoying, distracting and simply embarrassing to have to walk around with a loud pair of shoes. There are ways to handle squeaking shoes, but the first and utmost thing you need to do is to identify the reason for the squeaking, before addressing the problem. To find out the reason for the annoying squeaking, start watching the cases in which your shoes are squeaking. Do they squeak only when you walk on hardwood floors, when they are wet or when you are wearing them barefoot? Well, if the noise is produced when walking on hardwood, then the most possible reason is a friction problem. If you hear the sound when you are walking in wet conditions, then it could be that there is air stuck in a hole or crack in the sole. If you only hear the squeaking when you are barefoot and it is warm, then most probably your sweaty heels are causing the squeaking. Of course, some squeaking can be caused by serious shoe hardware problems, such as loose connections, cracks and other problems which can sometimes be taken care of by a cobbler. Decrease any friction inside or outside of the shoe. Take the footbeds out and apply cornstarch or talcum or baby powder beneath them. The powder will help keep the insoles in place and will prevent them from squeaking when there is moisture in the shoes. If the squeaking is coming from the upper part where the tongue and the laces meet, you can powder that area as well. If it’s the base that is making that horrendous sound, then you can have an air bubble stuck in the outsole near the seam. Massage the area again with talcum or baby powder in order to get the air pocket out. To keep the uppers of leather shoes from stretching over the sole and squeaking, you should periodically treat the shoes with tiny amounts of plant-based oils to condition the leather and keep it in shape. Dry leather will tend to squeak, so condition the leather with saddle soap another conditioner, but always test it first before applying all over the shoes. For shoes which squeak when walking on hard flooring only, it is very possible that the outsoles need to be sanded with sandpaper so that the friction is reduced. Use the sandpaper gently. You can also try an old trick which involves rubbing ordinary dry soap on the outsoles to resolve the problem with squeaking on hard floors. Use multi-purpose super glue or a special rubber or leather adhesive to stick a loose part of the sole, a heel or other part of the shoe. If your shoes squeak when you walk barefoot in them, then it is likely the moisture from your heels causing the sounds. You can wear socks, or powder the footbeds with talcum, baby powder or cornstarch. If nothing is helping, maybe it is time to ask a professional cobbler. Many times, it is structural problems in the shoes themselves which causes the squeaking. A good cobbler should be able to provide you with a solution. Make sure your shoes are dried properly if they tend to squeak when you wear them in wet conditions. This means letting leather shoes and other shoes drying naturally. You can help the shoes dry faster by stuffing them with newspapers, paper towels or kitchen roll paper, and changing it with dry ones periodically. If nothing helps, then you can take them back to the store if they have a quality warranty. Often the shoe structural problems are due to poor design and low quality of the materials and the production process itself. So, in most cases, squeaking shoes can be handled at home with common household products which bring immediate silence to the shoes. In other cases, you may want to ask a professional to give you a hand when dealing with the problem.